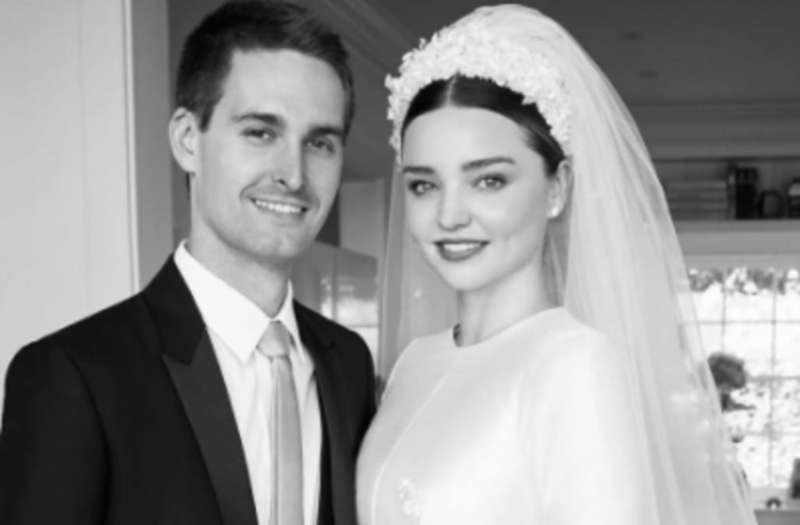 Miranda Kerr looked like an absolute princess on her wedding day! The Victoria's Secret model wed Snapchat founder and CEO Evan Spiegel back in May, and she finally shared photos from the big day -- including her stunning white dress -- on Sunday. The 34-year-old model wore a gorgeous Dior Haute Couture gown for the ceremony that took place in the backyard of the couple's Brentwood, California, home. The Australian beauty wore a long-sleeved wedding dress custom-made by Dior artistic director Maria Grazia Chiuri and an eye-catching pearl-encrusted headpiece by milliner Stephen Jones. Kerr revealed the gown was inspired by Grace Kelly's famous 1956 wedding dress to marry Prince Rainier of Monaco. "A dress that fully covers you creates a sense of purity and mystery. I've had a lot of fun with fashion, and I used to be more wild, free, bohemian. But in this period of my life, my style is more pulled back," said Kerr. "My greatest sources of inspiration have always been Grace, Audrey Hepburn, and my grandmother, who at 80 has an effortless chic: a nice pant, a white blouse, a scarf, a little heel." Their wedding was an intimate affair, with 45 of their closest friends and family in attendance. However, the wedding was a bit unorthodox compared to others. The morning before the ceremony, the two did yoga together to calm their nerves. During the reception, Kerr actually cooked Spiegel a slow-roasted chicken scented with turmeric and lemon dish, while the caterer replicated the meal for their guests. #JulianneHough and her Canadian hockey player husband #BrooksLaich tie the knot in a beautiful outdoor ceremony.